The Ulton Kmkamo Mechanical Mod Clone is a hard-hitting mech mod made from aluminum alloy and brass. It comes with extra 24mm hybrid connector. The mech mod features Innovative button, which changes pressing ways by the screw. The mod is powered by single 18650 battery (NOT INCLUDED). This item also has other colors to choose. 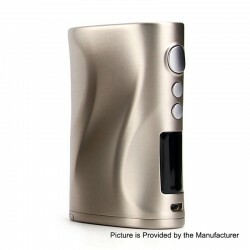 The Original Nikola Medea Mod is a 218W mod constructed from zinc alloy. 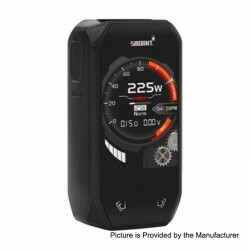 Powered by dual replaceable 18650 batteries (NOT INCLUDE), it features 0.96-inch OLED display, built-in memory mode and 4-tier output modes allow for different patterns and vaping experiences to vapers. Crafted by the exquisite workmanship, the beauty of streamline design is greatly shown in this Box Mod. This item also has other colors to choose. This USB charger has single port for charging. It is suitable for Juul device. 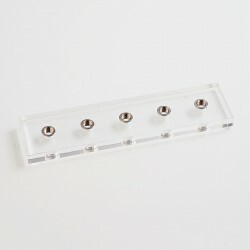 The Coil Father display base stand is made out of acrylic. 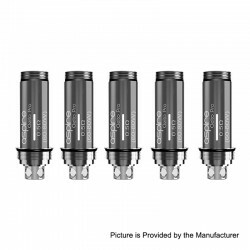 It is suitable for all sizes of atomizers. It can help you hold your favorite atomizer on the deck. This item also has other Version to choose. 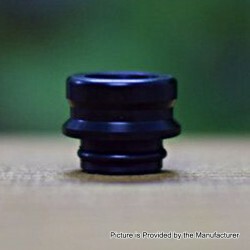 This Conversion Cap is made for the purpose of converting your 24mm Profile RDA into a 22mm buddy. Reserving the same adjustable air inlet design but paired with flavor enhancing drip tip for different preferences. The kit includes a removable decoration ring to give a choice of 24mm look if you like. And the word "Profile" is engraved noticeably on the sleeve. This item also has other colors to choose. Wotofo Agleted Organic Cotton is inspired by the ever increasing needs of fast cotton preparation for your rebuilding convenience. The cotton we selected are of long fibers so that it wicks smooth and its not easy to pull apart. However, that's not the best part, the best part is that we put a sheath on one end of the cotton strip so as to function like the aglet on your shoelace, then its much easier to thread the cotton through the coils. 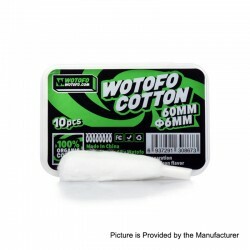 Each cotton strip is ready-to-use with proper cotton amount especially for the Profile mesh RDA. The cotton features great absorption capability and better retention ability, freshly packaged to deliver the purest flavor. There are 10 pieces of agleted cotton strips in one little box, convenient to carry around and stored in a clean way. 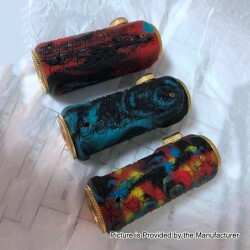 The SOB Uno Bersikulo Mechanical Mod Clone features resin chassis, brass hybrid top cap and tube, Ultem fire button on the side and copper battery door. It is powered by single 18650 battery (NOT INCLUDED). This product comes with random color. More options than what's on the image. 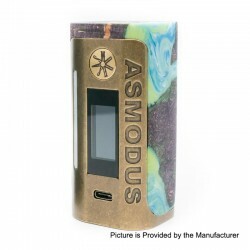 The Original Asmodus Lustro Box Mod is a versatile regulated mod powered by dual 18650 batteries (NOT INCLUDED), which can reach maximum output to 200W. With a capacitive touch screen, the operation on Lustro is very easy to vapers. Working with the latest GX-200-HUT chipset, Lustro Box Mod provides high performance in all aspects. The Curve output mode allows for detailed customization of the firing curve. The Lustro Box Mod will bring you the most comfortable vaping experience. This item also has other colors to choose. The EOS II features the GX-180-UTC, a chipset that packs a punch and saves battery life. With the new chipset equipped, you can really personalize your device to your liking from changing the color of your screen, how to unlock your settings mode, setting your puff limit, and much more. The new software in the GX-180-UTC features our "swipe left to right or right to left to change firing modes". We've also included a SOFT, NORMAL, and HARD firing modes. The EOS II is composed of beautiful stabilized wood, acrylic / resin on a lightweight aluminum frame to make a feather-like mode. There are 3 optional firmware files to cater to those who love the colored screen, or a basic and clean looking screen. The Base firmware that the EOS II comes with features our colorful screen that some of the community likes. The other 2 optional firmware files; one allows you to choose your favorite RGB color for your home menu, and change the brightness of your screen; the other firmware file is a nice and simple black screen with white text, but also allows you to change little bits of color personalize your mod in the simplest of ways, plus brightness settings. This item also has other colors to choose. 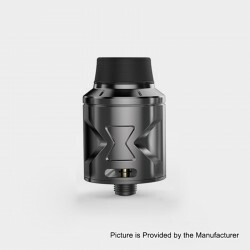 The Original Shield Cig Mark XLIV RDA is a 30mm cloud beast rebuildable dripping atomizer. It features a cross style build deck, which allows you to make a quad-coil build or even 8-coil build! The whole deck is gold plated and the 510 pin is silver plated for great conductivity. It comes with adjustable side airflow on 4 sides. 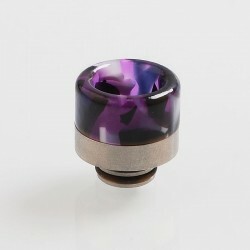 A wide bore POM drip tip is included. This item also has other colors to choose. 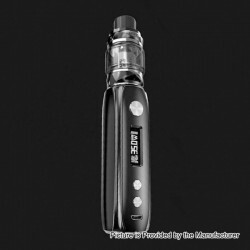 The Eleaf iJust ECM kit is a classic pen-style starter kit with a diameter of 25mm. 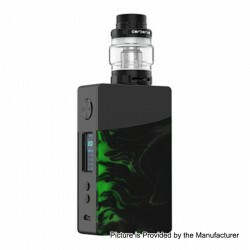 Powered by the built-in 3000mAh battery with direct output mode, the iJust ECM kit can fire up to 40W maximum output with the colorful LED battery level indicator light and multiple circuit protections. 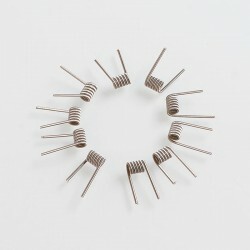 Moreover, two new EC Mesh coils are available on the kit, the EC-N, and EC-M. The two coil heads are constructed using a different style of mesh, which provides a much bigger surface area allowing for better flavor and bigger clouds. To fill the tank, you just need to slide the drip tip back to reveal the fill port. This item also has other colors to choose. The Original Asmodus Colossal 80W Mod Kit consists of the Asmodus Colossal 80W TC VW Box Mod and Wotofo Flow Pro Sub Ohm Tank. This item also has other colors to choose. The Original Asmodus Colossal 80W Mod is a beast of a single battery mod (BATTERY NOT INCLUDED) that is perfect for when you are on the go. 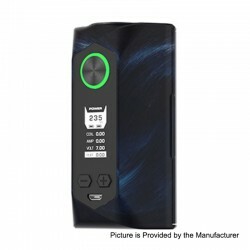 This petite mod features an advanced chipset with a new and improved UI and is sure to impress due to the incredible portability combined with the massive power. The Colossal features a full firing mode suite, including variable voltage, curve mode, temperature control presets for Ni200 nickel, titanium, and stainless steel heating elements as well as adjustable TCR and TFR modes. 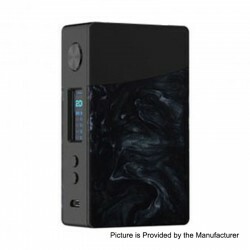 The Colossal also utilizes an Asmodus developed "battery safe connection" on the positive battery port which provides a safer, more secure connection by encasing the port with a plastic rim which forces the battery to stay in place. A USB port (for firmware updating) has been implemented as well to ensure that your mod is always up to date. The Wotofo Flow Pro Sub Ohm Tank is a 25mm diameter that fits perfectly on the colossal to make a beautiful combination. The Tank is an easy to fill tank that features a threaded top fill system, capable of holding up to 5ml of E-liquid. Additionally, it is compatible with SMOK TFV8 Baby Beast Coils for more versatility. Airflow enters the tank via dual adjustable bottom airflow with air slots measuring at 12mm by 2mm each, that can be fully closed. With its simplistic design and replacement coil versatility, it works beautifully with our Colossal 80w Box Mod. 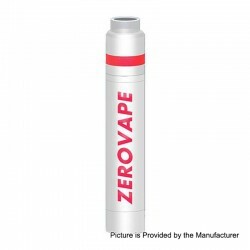 The Original Zerovape Start Mechanical Mod Kit consists of Zerovape Start Mechanical Mod and RDA. This item also has other colors to choose. 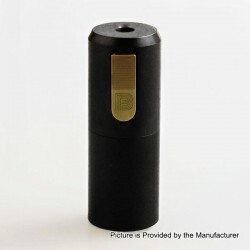 The Zerovape Start Mechanical Mod is made from brass and stainless steel. 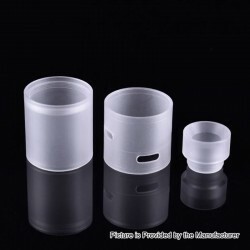 It is 24mm diameter, which fits most of mainstream atomizers. All contact elements are made from brass. The mod looks elegant and feels smooth when you hold it in your hand. The mod is powered by single 18650 battery (NOT INCLUDED). 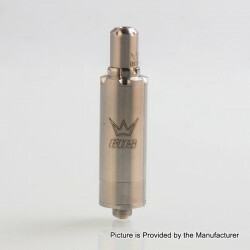 The RDA is a 24mm rebuildable dripping atomizer made from stainless steel. It has a clamp style post build deck and the clamp on top is made from PEEK. It supports dual coil builds. The airflow is adjustable on the side. The Original OBS Cube Mod is constructed from zinc alloy, it is powered by a built-in 3000mAh 23600 A+ high rate battery, with the fire speed of 10 milliseconds, it is very safe and durable. It features 0.96-inch LED screen, high - tech appearance, ergonomic design, comfort grip and exquisite buttons. The 1.5A charge current makes it safe and efficient to charge within 2~3 hours. This item also has other colors to choose. 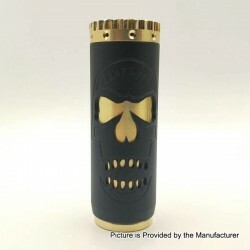 The Avid Lyfe Complyfe Saw Tube Mod Clone is a mechanical mod with a diameter of 30.5mm which is constructed from brass. It is powered by single 18650, 20700 battery (NOT INCLUDED). The fire button is activated by magnets. This item also has other colors to choose. 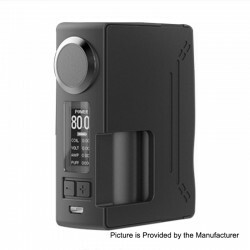 The Original Dovpo Rogue Mod is a single 18650 / 26650 (NOT INCLUDED) versatile device with multiple modes and protection. The output wattage can be adjusted at between 5W and 100W. Rogue has full temperature control suite and supports CCW and CCT modes. The battery cover has stylish and aesthetic pattern, making this mod more unique. The Original GeekVape Alpha Sub Ohm Tank is a clearomizer with 25mm diameter, 0.15ohm resistance and 4ml capacity. It is the flagship sub ohm tank fully developed by Geekvape Team, it presents unrivaled vaping experience to users with its meticulously made MeshMellow Coil System, which features the purest flavor from the very first inhale. Unlike any other coil of its kind, the MeshMellow coils uses the best cotton to ensure the perfect flavor. This item also has other colors to choose. 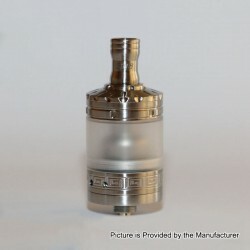 The Unfollow Momentous V2.1 RTA Clone is a 22mm rebuildable tank atomizer made from 316 stainless steel and PC tube. It features 3.7ml of juice capacity, narrow chimney and adjustable airflow control with three holes on each side. It can be refilled from the top. 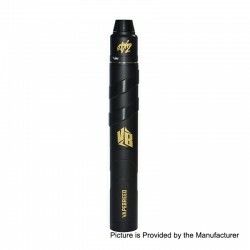 The SOB Mech Kit Clone consists of SOB Mech mod Clone and Outlaw RDA Clone. 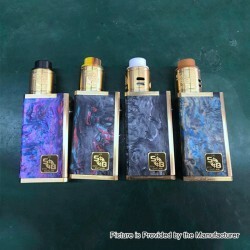 The SOB Mechanical box mod Clone is constructed from brass and resin and is powered by single 18650 battery (NOT INCLUDED). The battery access door is easy to remove by hand and the inner battery tube is insulated. The venting holes are positioned at the access door. The logo and series number are on the mod. The mod will come with random color. 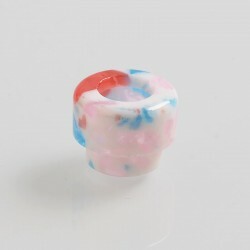 The drip tip will also come with random color. The ShenRay Steam T Nano Kit Clone consists of 316 stainless steel top lid and chimney, Acrylic tank tube and POM drip tip. It is suitable for ShenRay Typhoon GT4 RTA Clone. This product comes without logo. This item also has other Version to choose. The ShenRay Replacement Tank Tube, top cap and drip tip are made from PC and is suitable for ShenRay VG Extreme RTA Clone. 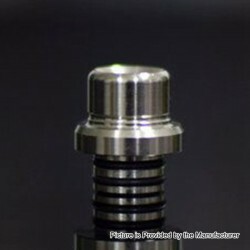 The Vapeasy SteamTuners T9 510 Drip Tip Clone is made from stainless steel. It is suitable for all atomizers that fit 510 drip tip. The Dee Mods Shorty V2 510 Drip Tip Clone is made from POM. 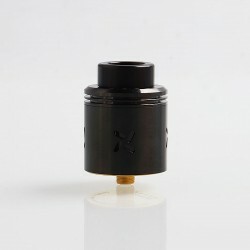 It is suitable for all atomizers that fit 510 drip tip. This item also has other colors to choose. The Smoant Naboo Mod is a versatile regulated box mod with a lot of functional modes and protections. 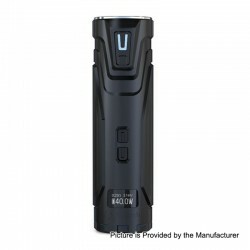 It is powered by dual 18650 batteries (NOT INCLUDED) and can be fire up to 225W. The Naboo Mod has a 2.4 inch TFT color screen and comes with 2 + 1 UI options. With the touch button, which provides tactile feedback and make you enjoy the fun of vaping. This item also has other colors to choose. 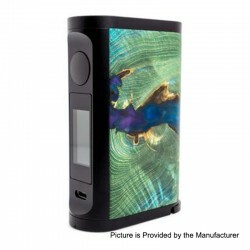 The Eleaf iJust ECM comes in a fashionable looking and each color has its own unique pattern, making the iJust ECM stand out from other tube mods. Fitted up with an internal 3000mAh battery, the iJust ECM is long sustainable, while its multiple circuit protections will keep you vaping safe. The LED light on the button is not only gorgeous but will cycle through three colors to let you know at a glance how much battery life is remaining. Efficient, simple and sustainable, it's the Eleaf iJust ECM. This item also has other colors to choose. 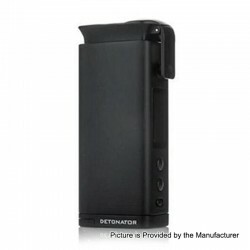 The Original Vapor Storm Subverter Box Mod, powered by dual 18650 batteries (NOT INCLUDED), can reach maximum wattage to 200W. 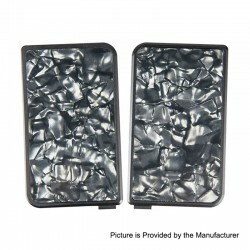 The side panels are made from beautiful resin and become aesthetic pattern. The mod comes with a 0.96 inch colorful display and big fire button. The resistance allowed is from 0.05 to 3ohm for power mode, 0.05 to 1ohm for temperature control mode. This item also has other colors to choose. The Original Smoant Campbel Kit consists of Smoant Campbel Mod, Campbel Filter and Campbel Tank. This item also has other colors to choose. 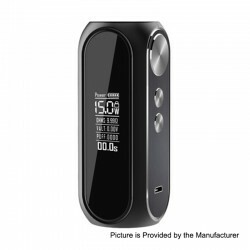 The Original Smoant Campbel Mod is a single 18650 vaping device with 80W full battery output. The resistance range is from 0.08 to 3.0 ohm. The mod is powered by single 18650 battery (NOT INCLUDED). 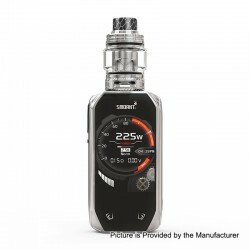 The Original Smoant Campbel Filter and Campbel Tank integrate innovatively as one piece, which allows vapers to vape with a mixture of e-liquid and soft drinks. 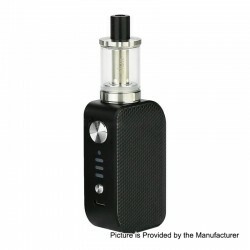 The Filter comes with 3ml of capacity for soft drink, while the tank comes with 2ml of capacity for e-juice. The tank adopts Ni80 0.2ohm coil, which works well at 30 to 60 Watts. The Smoant Naboo Kit consists of Smoant Naboo Mod and Naboo Mesh Tank. This item also has other colors to choose. 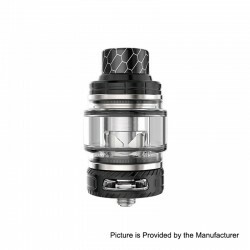 The Smoant Naboo Mesh Tank is a 25mm sub ohm tank with 4ml of juice capacity. It supports two kinds of mesh coils, the Mesh 0.18ohm coil for 40~80W power and the Mesh 0.17ohm coil for 60~100W power. The tank comes with adjustable airflow control system for optimal flavor. The Original Wismec SINUOUS Solo Starter Kit is a compact and sleek vape pen kit with a fascinating appearance. 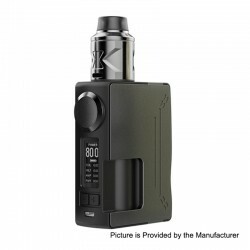 It consists of the Wismec SINUOUS Solo 2300mAh mod and Amor NS Pro tank. This item also has other colors to choose. The Wismec SINUOUS Solo mod is powered by an internal 2300mAh battery, it can fire up to 40W and supports direct output and constant power output with multiple circuit protections. Besides, the indicator light will stay lit or flash slowly when the battery quantity is high. On the contrary, the indicator light will flash in frequency. The included Amor NS Pro tank has a diameter of 22mm, it features new 0.27ohm WS-M (Mesh) coil and 2ml capacity, with the retractable top filling solution and refined airflow control system, it will provide you a convenient vape experience with big cloud and great flavor. 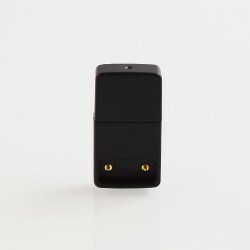 The SMPO OS kit is a perfectly compact and portable pod that utilizes a simple draw activated system along with one button control. The advanced chipset features Auto temperature control and low e-liquid level detection, which eliminates e-liquid burning and gives optimal vape flavor delivery. The SMPO kit features short circuit, no load, low power, overtime, and overcharge protection which makes the SMPO OS Kit a safe device for all. The SMPO OS Kit adopts a 650mAh build-in battery with quick charge capability. It just needs 40 mins to fully charge your SMPO OS device. And there is an indicator light that glows to show relevant battery levels. This item also has other colors to choose. The Original Eleaf EC-M Coil Head is a replacement coil head constructed from kanthal, which has a resistance of 0.15ohm and is rated at 30W to 75W. It is suitable for Eleaf iJust ECM 3000mAh Starter Kit. Using a new style of mesh, the Eleaf EC-M coil head provides a much bigger surface area, presenting an ultra flavorful taste with huge clouds and a longer lifespan than ever. This product comes with 5 PCS in a pack. This item also has other Version to choose. The Original SMPO OS Replacement Pod Cartridge is designed for the SMPO OS pod system starter kit. It is a 1.8ml refillable pod cartridge with easy side filling design. Together with the innovative CCELL heating system, the OS refillable pod will bring you pure and great flavor. This product comes with 2 PCS in a pack. The replacement front and back panels are made from resin and is suitable for Original Vapor Storm Subverter Mod. This product comes with 1 x Front Panel, 1 x Back Panel, totally 2 PCS in 1 pack. This item also has other colors to choose. 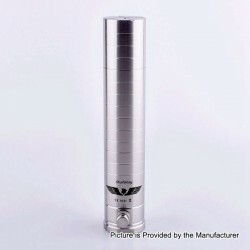 The Nova mod is a high-performance device that powers up to 200W with dual 18650 batteries (NOT INCLUDED). Powered by the advanced AS chipset that has unmatched speed and power. Designed with elegant aesthetics, Nova is built with premium quality aluminum alloy and beautifully crafted resin, delivering an exquisite contrast that portrays simplicity and elegance. This item also has other colors to choose. The Rogue Purity Mechanical Mod Clone is constructed from brass in 24mm diameter. It is powered by single 18650 /20700 battery (NOT INCLUDED). It features 510 hybrid top cap and spring fire button. 18650 battery adapter is included. This item also has other colors to choose. The Broadside Nashty Mech Mod Clone is constructed from brass and tapers to 25mm diameter. It comes with non-spring and non-magnet design, which helps reduce hot button and misfires. 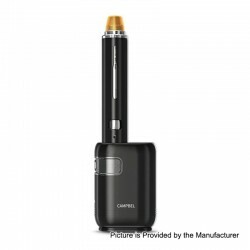 The mod is powered by single 18650 / 20700 battery (NOT INCLUDED). A 18650 battery adapter is included. This item also has other colors to choose. 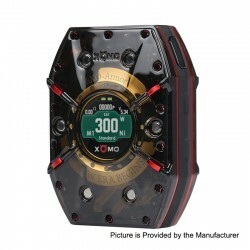 The Original XOMO EXO-Armor Mod is a TC VW box mod constructed from zinc alloy and high-quality PC, designed by SJC and XOMO, the first dual 18650 battery (NOT INCLUDED) mod with 300W max output. Constructed by 9 pieces zinc alloy and high-quality PC, it's highly anti-scratch and fingerprint-resistant, and it's processed by UV protective surface treatment. On each side, it's decorated by 14 delicate stars in red and black colors. Powered by Yihi Chipset, EXO-Armor plays ultra stable and powerful vaping experience. The luxury golden ring surrounds the TFT HD screen, on which 16 small dots shine green in dark night. The UI interface suits both android and ios systems, and it has 10 selective wall papers for you to choose. This clock mod supports VW, TC and TCR Modes, and its SXi-Q Intelligent Taste Curve can be adjusted to have 5 options for taste. The Original Aspire Cobble Kit is a great new all-in-one device from Aspire, it is designed with comfort in mind and an easy filling method. 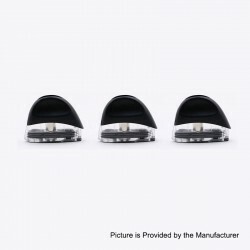 The ergonomic design pod system holds a 1.8ml capacity of e-liquid, houses a nonreplaceable 1.4ohm BVC type nichrome coil for efficient vaping to give you a flavorful vape. The Cobble is small and very light but with plenty of power and fits easily into even a small pocket or purse. This item also has other colors to choose. The Original GeekVape Nova Kit consists of GeekVape Nova Mod and Cerberus Sub Ohm Tank. This item also has other colors to choose. The Nova mod is a high-performance device that powers up to 200W with dual 18650 batteries (NOT INCLUDED). Powered by the advanced AS chipset that has unmatched speed and power. Designed with elegant aesthetics, Nova is built with premium quality aluminum alloy and beautifully crafted resin, delivering an exquisite contrast that portrays simplicity and elegance. The Cerberus sub ohm tank is optimized by the ultimate Super Mesh coil that maximizes heating contact surface area in order to provide maximum flavor and large vapor production. Super Mesh Coils are compatible with Aero Mesh tank too. 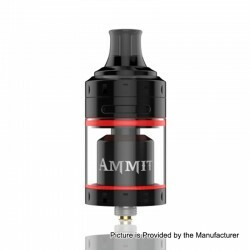 The tank comes with 27mm diameter and 4ml of juice capacity. The Rogue Purity Mech Kit Clone consists of Rogue Purity Mod Clone and Rogue Force RDA Clone. This item also has other colors to choose. 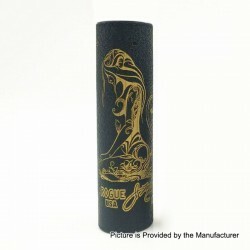 The Rogue Purity Mechanical Mod Clone is constructed from brass in 24mm diameter. It is powered by single 18650 /20700 battery (NOT INCLUDED). It features 510 hybrid top cap and spring fire button. 18650 battery adapter is included. The Rogue Force RDA Clone is a 24mm rebuildable dripping atomizer made from brass. It features triple-post build deck with quad terminals for easy dual coil builds. It comes with side airflow for smooth vapor and great flavor. The Broadside Nashty Mech Kit FClone consists of Broadside Nashty Mech Mod Clone and Culverin RDA Clone. This item also has other colors to choose. 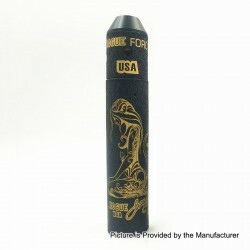 The Broadside Nashty Mech Mod Clone is constructed from brass and tapers to 25mm diameter. It comes with non-spring and non-magnet design, which helps reduce hot button and misfires. The mod is powered by single 18650 / 20700 battery (NOT INCLUDED). A 18650 battery adapter is included. 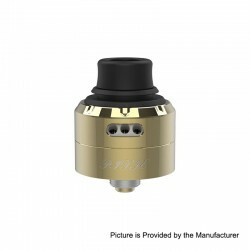 The Culverin RDA Clone is a 25mm atty constructed from stainless steel. The deck features dual post with teardrop post hole design. The side airflow offers great flavor and massive vapor production. 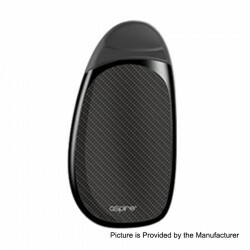 The Original Aspire Cobble pod is a TPD compliant replacement pod cartridge for Cobble Pod System Starter Kit. It comes with bottom fill system, 1.8ml capacity and a built in, nonreplaceable 1.4ohm Nichrome coil. It is designed for use with nic-salts but normal e-liquids can also be used. 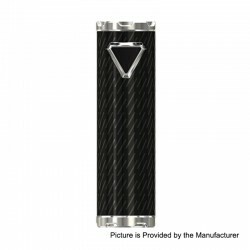 The Bestia Fiera Mod Clone is the smallest 20700 / 21700 mech mod. It is constructed from brass, with hybrid connection and side fire button. 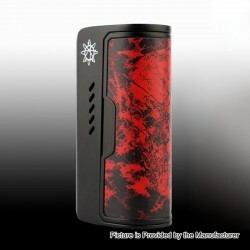 The mod is powered by single 18650 / 20700 / 21700 battery (NOT INCLUDED). Delrin 18650 battery adapter is included. 24mm RDA will not overhang on this mod. This item also has other colors to choose. The Original GeekVape Blade Mod, which maximizes the use of dual 18650, 20700 and 21700 batteries (NOT INCLUDED) and the maximum power can reach 235W, is a versatile device with high performance. Utilizing advanced aircraft grade material, it is very light and durable. This item also has other colors to choose. The VapeBreed AB Mod Kit Clone consists of a AB mechanical mod Clone and a 25mm VapeBreed V2 RDA Clone. Powered by single 18650 battery (NOT INCLUDED), the mod is a full mechanical mod made from brass and measures 25mm diameter. The RDA comes with dual posts design, adjustable airflow and adjustable center pin. This item also has other colors to choose. The Original Akattak Black Label Alien Clapton Kanthal A1 Pre-built Coils Heating Wire is made from Kanthal A1 wires and features 0.2ohm resistance and 26GA x 3 + 32GA wires. This heating wire will be a good vaping choice for DIY. This product comes with 20 PCS in 1 pack. This item also has other Version to choose. 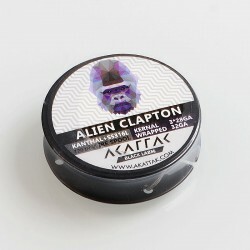 The Original Akattak Black Label Alien Clapton Wire heating resistance wire is perfect for RBA / RTA / RDA atomizers. The wire is made from Kanthal A1 and Stainless Steel 316L. It features 3 x 28GA + 32GA wires and 10 feet length, which will be a good choice for DIY. This item also has other Version to choose. The Original Akattak 3 in 1 Coil Kit comes with 10 x Clapton Coils (0.25ohm), 10 x Flat Clapton Coils (0.3ohm) and 6 x Staggered Fused Clapton (0.3ohm). These heating wires are made from Kanthal material and will be a good vaping choice for DIY. 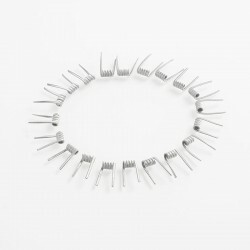 This product comes with 3 types of coils, totally 26 PCS in 1 pack. This item also has other Version to choose. The Original Geekvape Meshmellow Coil is specially designed for the Geekvape Alpha Subohm Tank. It is a 0.15ohm single core coil head with a output power range of 60~110W (Best for 75~95W). All cotton of MeshMellow coils are imported from Egypt, which delivers purest flavor from first inhale. The MeshMellow mesh coils maximizes heating contact surface area for pure flavor and huge & thick vapor. This product comes with 3 pieces in a pack. This item also has other Version to choose. 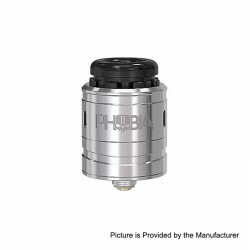 The Kindbright MTL RBA is made from 316 stainless steel and PEEK insulator. It is suitable for SXK Billet Box Mod Clone/ YFTK Billet Box Mod Clone. It supports single coil builds. The Original Smoant Naboo Mesh Tank is a 25mm sub ohm tank with 4ml of juice capacity. It supports two kinds of mesh coils, the Mesh 0.18ohm coil for 40~80W power and the Mesh 0.17ohm coil for 60~100W power. The tank comes with adjustable airflow control system for optimal flavor. This item also has other colors to choose. The Original 5GVape Freedom RDA is constructed from 316 stainless steel and PC cap with 22mm diameter and 30.5mm height. It can be refilled both from the top and bottom. The top adjustable surround intake mode makes the Strong taste. This RDA comes with a bottom feeder pin. This item also has other colors to choose. 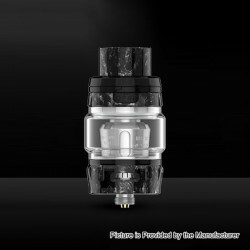 The AIOLOS V2 RTA Clone is a tiny rebuildable tank with 16mm diameter and 2ml of juice capacity. It is made from 316 stainless steel and comes with a spare PMMA tube. The tank features narrow chimney for tasty vapor, single coil build deck and bottom airflow. The Original 5GVape Freedom RDA Kit consists of a freedom RDA, 3 spare caps, 3 replacement drip tips and 3 decorative rings. The RDA is constructed from 316 stainless steel with 22mm diameter and 30.5mm height. It can be refilled both from the top and bottom. The top adjustable surround intake mode makes the Strong taste. This RDA comes with 3 caps, 3 drip tips, 3 decorative rings and a bottom feeder pin. This item also has other colors to choose. 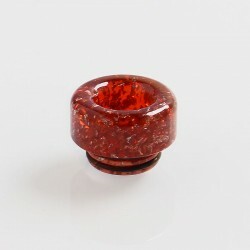 The 810 drip tip is made from resin. It is suitable for Goon RDA, Goon RTA, Lost Art Goon RDA, Goon LP RDA, Kennedy 24 / 25 RDA, Battle RDA, Kryten RDA, Mad Dog RDA, Mask RDA, CSMNT Cosmonaut RDA, Unholy RDA, Apocalypse GEN 2 RDA, Reload RDA, Mini Battle RDA, Avid Lyfe Captain Cap II, Sith RDA. This item also has other colors to choose. 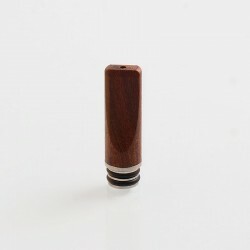 The replacement 510 drip tip is made from wood. It is suitable for all atomizers that fit 510 drip tip. 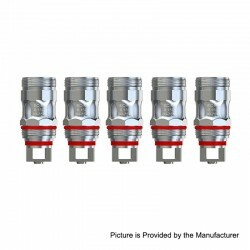 The Coppervape SteamTuners Replacement Tank Tube Clone is made from PC and has 3.5ml of juice capacity. 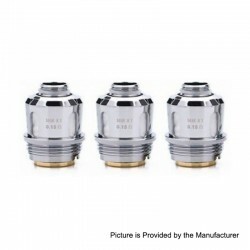 It is suitable for Coppervape Dvarw MTL RTA Clone. This item also has other Version to choose. This product consists of two Snow organic cottons and two pre-built coils. One coil is a 0.3ohm clapton coil which is constructed from kanthal A1, the other is a 0.35ohm mix twisted coil made from Ni80. The Original Hugsvape Snow Cotton utilizes 100% natural organic cotton, it is good and easy for DIY coil building and can provide a clean pure flavor. This product comes with 20 PCS in 1 pack. 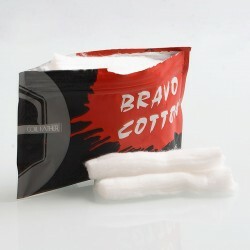 The Original Coil Father Bravo Cotton is designed for dripping lovers. It is made of 100% organic cotton and is took through a thorough purification process to remove impurities and natural oil. It doesn't require a "break in period", and provides a clean flavor from your first pull to the last. No boiling necessary, simply Pinch, Tear and Vape. This product comes with 15 PCS in a pack. The Original Coil Father PUMP2 Liquid Dispenser is an oil injector for RDA and squonk mod with a 27mm diameter and 122.5mm height. It comes with plastic shell, soft silicone bottle and stainless steel cap. With the 30ml e-liquid capacity, it can feed the squonk mod with e-juice via 510 thread. This item also has other colors to choose. The Original Smoant Replacement Coil is specially designed for the Naboo sub ohm tank Clearomizer. It is a 0.17ohm coil head with an output power range of 60~100W. This product comes with 3 PCS in a pack. This item also has other Type to choose. The ShenRay Vapor Giant Mod Clone is a mechanical tube mod constructed from stainless steel and powered by single or dual 26650 battery (NOT INCLUDED). It features spring fire button, bottom venting holes and adjustable 510 connector. The Original Vapefly Pixie BF RDA is a 22mm RDA that constructed from stainless steel and Delrin. It features super easy building deck for single coil and side airflow system that easy to push and adjust. There are two different airflow hole including single airflow hole and multiple airflow hole for you option. Besides, with avoid heating deck design and triangle airflow path, this RDA will bring smooth air and massive cloud. 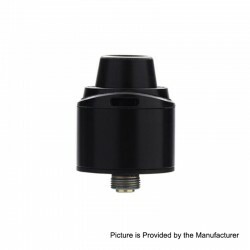 The Original One Top Onetopvape Gemini RDTA is a 26.5mm diameter RDTA which is especially two sizes cap designed you've never seen in vape market. Constructed by 304 Stainless Steel and PC, it is well-built and durable. With the dual post build deck and quad terminals, it is very easy to build. Together with the Quad terminal and side airflow system, Gemini RDTA will bring an excellent vaping experience for you. The Original IJOY Katana Starter Kit consists of the IJOY Katana ALM Mod and Katana Sub ohm Tank. This item also has other colors to choose. The IJOY Katana ALM Mod is powered by a built-in 3000mAh battery with the IWEPAL chip, the mod can fire up to 81W maximum output and supports Power, Pod, MTL, Bypass, PMode and Temp modes to satisfy your different vaping needs. What's more, the Katana Kit features fast ignition and quick charging function. And the 0.96inch OLED display will inform you essential parameters you need. The Katana Sub ohm Tank features a 25mm diameter and 0.2ohm resistance. It comes with a big capacity and the IJOY coil produces pure taste and large cloud. 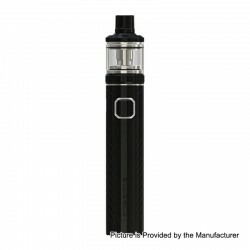 The Original Arctic Dolphin ELUX Starter Kit consists of Arctic Dolphin ELUX 1300mAh mod and Dolphin ELUX Sub Ohm Tank. This item also has other colors to choose. The Arctic Dolphin ELUX Mod is so lightweight that you can carry it everywhere and hold the compact device in hands. Powered by the 1300mAh built-in battery, the kit can fire up from 5W to 30W maximum output. The included sub ohm tank comes with 2ml juice capacity and 2.0ohm coil for dense flavor and optimal cloud. The Original Akattak Clapton 2Core Ni80 Pre-built Coils Heating Wire is made from Nichrome 80 wires and features 0.25ohm resistance and 26GA x 2 + 38GA wires. This heating wire will be a good vaping choice for DIY. This product comes with 10 PCS in 1 pack. This item also has other Version to choose. The Original Nikola Wolverine is a TC VW box mod constructed from zinc alloy and ABS material to strengthen the overall texture while enhancing the fitness of grip. With its baking finish technique, the Wolverine is refined in workmanship, unified in gap and tight in installation, the new design offers an ergonomic hand feel for users. 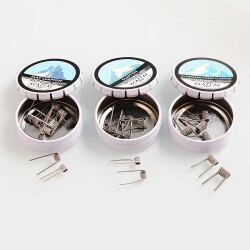 It features include 7~230W stable output, temp control switchable and 4 different taste modes. Its ultra long battery life is ensured by dual 18650 batteries (NOT INCLUDED) and large battery capacity. The Wolverine has 1.5A micro USB charging function, making it convenient for users to charge the battery. This item also has other colors to choose. The Original Squid Industries Detonator Mod, powered by single 20700 / 21700 battery (NOT INCLUDED), is an aggressively yet beautifully designed chassis with a unique trigger button and a sophisticated advanced board with extensive temperature control suite. The protruding firing button is intuitive and is ready to begin vaporizing e-juice at first touch. The two adjustment buttons sit below the brilliantly illuminated OLED display screen and sit above the on / off switch. This item also has other colors to choose. 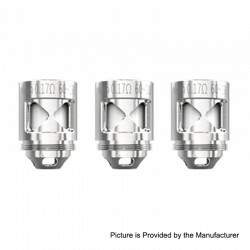 The Original Hugsvape Piper BF RDA is constructed from stainless steel with 24mm diameter. It is a dual vertial coil RDA with both 510 pin and squonk pin, its bottom airflow transfers to side airflow through the tube and then hits the coils directly from inside. And the Piper RDA is perfectly matched with the Hugsvape Surge Squonk Mod. The Original Hugsvape Surge Squonk Mod Kit consists of Surge 80W squonk TC VW box mod and Piper BF RDA. This item also has other colors to choose. The Original Hugsvape Surge Squonk Mod is a TC VW box mod constructed from PC and glass fiber. Powered by single 18650 / 20700 battery (NOT INCLUDED), it is able to reach up to a maximum output power of 80W. And the battery door is strongly held by magnets. The Surge Squonk Mod also support 4 working modes: Power, W-VPC, Bypass and TC to meet different vaping needs. 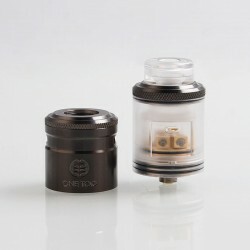 The Vapesoon 810 drip tip is made from resin and stainless steel and comes with a silicone cap to protect it from dust. It is suitable for TFV8 Tank, TFV8 Big Baby Tank, TFV12 Tank, Goon RDA, Goon RTA, Lost Art Goon RDA, Goon LP RDA, Kennedy 24 / 25 RDA, Battle RDA, Kryten RDA, Mad Dog RDA, Mask RDA, CSMNT Cosmonaut RDA, Unholy RDA, Apocalypse GEN 2 RDA, Reload RDA, Mini Battle RDA, Avid Lyfe Captain Cap II, Sith RDA. This item also has other Version to choose. The Original Joyetech ULTEX T80 80W mod comes with an exquisite carving appearance and portable pen-style body. For perfectly match with the Cubis Max tank, the ULTEX T80 mod adopts mechanical style design. Powered by single 18650 battery (NOT INCLUDED), it can fire up to 80W maximum wattage output, powerful as mesh mod. It also equips a 0.49-inch OLED screen which is located on the downside. Moreover, the mod supports upgrade firmware. This item also has other colors to choose. 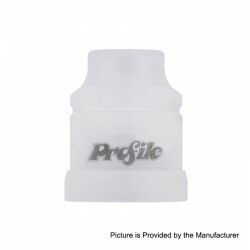 The Original Cleito Pro Sub Ohm Tank comes with a 24mm diameter and new 0.5ohm coil (also compatible with the Cleito and the Cleito Exo tanks), with phenomenal wicking capability for this type of coil, it ensures increased vapor and flavor, just as you'd expect from Aspire innovations. 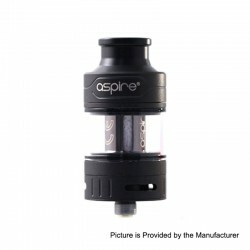 Also included is Aspire new mesh coil rated at 0.15ohm. It features 3ml capacity and also can be extended to 4.2ml by using extra bubble glass tube. With the improved flavor and vapor production you can form your own mini weather system each time you vape. This item also has other colors to choose. 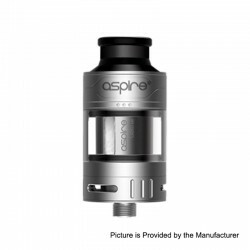 The Original Aspire Cleito 120 Pro Tank is the latest addition of Cleito family. 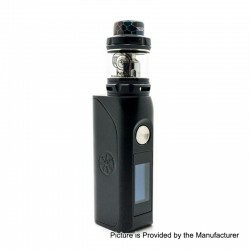 The tank continues the classic appearance and comes with 3ml capacity. It also can be extended to 4.2ml by using extra bubble glass tube. 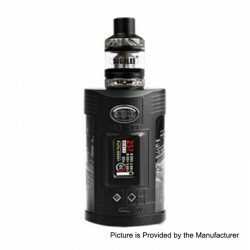 The Cleito 120 Pro tank features a 0.15ohm mesh coil and a 0.16ohm Cleito 120 coil. Both of them have phenomenal wicking capability and enhance flavor. It adopts bottom adjustable airflow design for produce huge vapor clouds and better vaping experience. 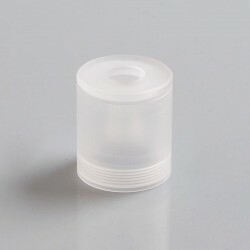 Top side filling design makes refill easier and avoid leakage. This item also has other colors to choose. The Original Joyetech ULTEX T80 80W Kit is consisted of Joyetech ULTEX T80 vw mod and Cubis Max tank.This item also has other colors to choose. The Original Joyetech ULTEX T80 80W mod comes with an exquisite carving appearance and portable pen-style body. For perfectly match with the Cubis Max tank, the ULTEX T80 mod adopts mechanical style design. Powered by single 18650 battery (NOT INCLUDED), it can fire up to 80W maximum wattage output, powerful as mesh mod. It also equips a 0.49-inch OLED screen which is located on the downside. Moreover, the mod supports upgrade firmware. The Cubis Max tank equips innovative NCFilmTM heater which takes a horizontal building way in order to achieve great vaping experience. With the coil-less design, the NCFilmTM heater is easy to clean and supports more than 3 months lifespan. The tank features top filling design and top airflow system, it allows a simple replacement of cotton for a pure and delicate vaping experience. Having the top-fill and top-airflow system, youre free of any leakage. 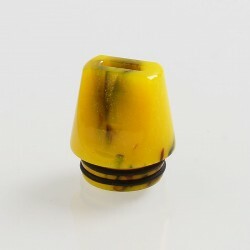 The replacement 510 drip tip is made from resin and stainless steel. It is suitable for all atomizers that fit 510 drip tip. This item also has other colors to choose. The Original Aspire replacement coil features 0.5ohm resistance and is rated at 60W to 80W, it is excellent for vapor production and compatible with Cleito, Cleito Exo tanks and will further enhance flavor. This product comes with 5 PCS in a pack.